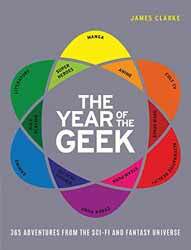 The Year of the Geek is a day-by-day diary of the geek year celebrating the most important events, anniversaries and adventures in the sci-fi and fantasy universe. With so many historical sci-fi dates to consider, how on earth do you pick just one for each day of the year? For example, which is more important between the following two? On the 19 May in 2005 the final George Lucas-directed Star Wars film was released Or that on the 19 May in 1983 WIlliam Shatner received his own star on the Hollywood walk of fame? Its subjective, I guess, but with so many interesting facts for each day of the year there's always going to be something more important that's missed. To be fair it throws its net wide encompassing cult favourites like A Clockwork Orange to Akira to the first Comic Con to Stan Lee... But as interesting and informative as this book is, there are plenty of websites online that are dedicated to bringing you this exact information. In fact sites like scifihistory.net have more facts for each day (mainly birthdays though) then you can ever hope to digest. In a time when most people have the internet right at their fingertips, it make you wonder who this book is aimed at. 20 years ago it would have been a fun purchase, now it seems a bit of frivolous purchase. It's something you'd buy for someone else, but not for yourself - the standard Christmas present for that person you don't really know all that well.